This investigation was undertaken to evaluate the therapeutic efficacy and safety of glycosylated undenatured type II collagen (UC-II) alone or in combination with glucosamine HCI and chondroitin sulfate in arthritic dogs. Twenty dogs divided into four groups (r - 5) were daily treated orally for 120 days: group I, placebo; group II, 10 mg UC-II; group III, 2,000 mg glucosamine * 1,500 mg chondroitin; group IV, UC-II (10 mg) * glucosamine (2,000 mg) + chondroitin (1,500 mg), followed by a 30-day withdrawal period. On a monthly basis, dogs were examined for overall pain, pain upon limb manipulation, and exercise-associated lameness. Serum samples were analyzed for markers of liver function (ALT and bilirubin) and renal function (BUN and creatinine). Body weight was also measured at a monthly interval. Dogs in group I exhibited no change in arthritic conditions. Dogs receiving UC-n alone showed significant reductions in overall pain within 30 days (33%) and pain upon limb manipulation and exercise-associated lameness after 50 days (66% and 44%, respectively) of treatment. Maximum reductions in pain were noted after 120 days of treatment (overall pain reduction, 62%; pain reduction upon limb manipulation, 91%; and reduction in exercise-associated lameness, 78%). The overall activity of the dogs in the UC-II supplemented with glucosamine and chondroitin group (group IV) was significandy better than the glucosamine + chondroitin-supplemented group (group III). Glucosamine and chondroitin alleviated some pain, but in combination with UC-II (gronp IV) provided significant reductions in overall pain (57%), pain upon limb manipulation (53%), and exercise-associated lameness (53%). Following withdrawal of supplements, all dogs (groups II to IV) experienced a relapse of pain. None of the dogs in any groups showed any adverse effects or change in liver or kidney function markers or body weight. Arthritis is a chronic disease that commonly affects large-breed dogs due to overweight/obesity, lack of exercise, physical injury, infection of joint surfaces, immune disorder, aging, or genetic predisposition. In particular, overweight and obesity in dogs can indirectly influence the degenerative joint disease process by increasing joint stress (Richardson et al. 1997). Dogs suffer most often with osteoarthritis than with rheumatoid arthritis (Hielm-Bjorkman et al. 2003). Arthritis is one of the most prevalent chronic hedth problems in the United States, affecting nearly 43 million people (Helmick et al. 1995). Although arthritis is often thought of as a disease that predominandy affects the elderly, it is the number one cause of disability affecting those over the age of 15. In fact, more than half of those affected by arthritis are under the age of 65, and almost 300,000 of those affected are children (Centers for Control and Prevention [CDC] 1994; Helmick et al. 1995; Trentham et al. 2001). Each year,arthritis is responsible for 44 million outpatient visits and almost 1 million hospitalizations, and is second only to heart disease in terms of its effect on disability from work (CDC 1994). As might be imagined from these statistics, the toll that arthritis takes on the health care industry is substantial, costing the United States approximately 55 billion dollars each year in health-related expenses. Unfortunately, the prevalence of arthritis does not appear to be decreasing, and by the year 2020 the CDC predicts that almost 50 million Americans will suffer from some form of arthritis. Rheumatoid arthritis is a chronic disease characterized by inflammation, pain, swelling, and stiffiress of multiple joints (Trentham et al. 1993; Okada 2000; Aceves-Avila et al. 2001). In either form of arthritis, dogs usually limp and are unable to move normally. Dog owners and veterinarians rarely notice the early warning signs of arthritis in dogs, since the dogs have the tendency to ignore soreness and discomfort until the arthritic signs are progressed significantly. Together, osteoarthritis and obesity cause a decreased quality of life for pets since joint pain is strongly associated wifh body weight (Richardson et al. 1997). The present therapy of arthritis in dogs relies upon drugs that alleviate pain, control inflammation, and preserve ability to perform daily activity. Chronic use of cyclooxygenase (COX) inhibitors (nonsteroidal antiinflammatory drugs [NSAIDs]) is linked to numerous side effects, including gastrointestinal (GI) bleeding and hepatic and renal dysfunction (Physician's Desk Reference [PDR] 1998; Muhlfeld and Floege 2005). Anti-inflammatory drugs, such as aspirin and ibuprofen, are nonspecific inhibitors of COX enzymes Ooth COX-I and COX-II), and they inhibit the production of inflammatory prostaglandins, thereby providing therapeutic effect, but they also inhibit the production of constitutive prostaglandins, causing severe side effects, such as severe GI bleeding (Matteson 2000). In the recent past, two commonly used drugs approved by the Food and Drug Administration (FDA) in arthritic dogs included Rimadyl (caqprofen) and Deramam (deracoxib). Both Rimadyl and Deramaxx are NSAIDs. Rimadyl is not recommended for animals with known bleeding disorders and should not be used if a dog has pre-existing liver disease, inflammatory bowl disease, or a known tendenry toward GI ulceration. Labrador Retrievers and other breeds are represented in the population that has experienced side effects or a fatal outcome from Rimadyl. Derama:or (deracoxib), a COXII inhibitor similar to Celebrex (celecoxib) and Viom (rofecoxib), prescribed as pain relievers for people, was withdrawn from the market in 2004, because of heart attack and stroke risk. According to a recent clinical study from the Mayo Clinic, other rheumatoid arthritic drugs such as Humira (adalimumab) or Remicade (infliximab) may cause serious infections or lead to the development of several kinds of cancer (Bongartz et d. 2006). Therefore, under the present circumstances, a safe therapy is needed for arthritic dogs. In recent years, due to widespread availability of nutraceuticals, glucosamine and chondroitin sulfate were the two most commonly used supplements to ease the pain and discomfort of arthritis in dogs. Nutraceuticds are defined as functional foods, natural products, or parts of food that provide medicinal, therapeutic, or health benefits, including the prevention or treatment of disease. Glucosamine is an amino-monosaccharide precursor of the disaccharide unit of glycosaminoglycan, which is the building block of proteoglycans, the ground substance of articular cartilage (Paroli et al. 1991). Chondroitin sulfate is a part of a large protein molecule (proteoglycan) that gives cartilage elasticity. Glucosamine is extracted from crab, lobster, or shrimp shells, and chondroitin is extracted from animal cartilage, such as tracheas and shark cartilage. In a recent pilot study, we found for the first time that daily administration of glycosylated undenatured type II collagen (40 mg ofUC-[ providing 10 mg/day) for 90 days significandy ameliorated the signs and symptoms of arthritis in dogs (DeParle et al. 2005). UC-II is a glycoprotein from chicken stemum cartilage. The presence ofglycosylated "active" epitopes in the UC-II collagen matrix was confirmed by a validated ELISA method available from Chrondex, LLC (Arthrogen-ClA Capture "ELISA" test). Furthermore, electron microscopic analysis of UC-II was conducted to demonstrate the conformational integrity of the undenatured triple helical structure of a protein (Bagchi et al. 2002). Based on this study and other research (Bagchi et al. 2002), the present investigation was carried out to evaluate the therapeutic efficacy and safety of the antiarthritic compound UC-II (10 mg/day) alone or in a combination with the two most commonly used nutraceutical supplements (glucosamine HCI and chondroitin sulfate) in arthritic dogs given daily for 120 days, followed by a 30-day withdrawal. Glucosamine and chondroitin sulfate have become popular supplements for arthritis and are widely used to ease the pain and discomfort in arthritic dogs. Another objective of this investigation was to determine if the UC-II in combination with glucosamine and chondroitin was well tolerated by arthritic dogs. A group of 20 adult client-owned dogs was selected for this study based on the signs of arthritis, such as joint stiffiress, lameness, and pain at the level of moderate severity. These dogs had swollen joints, and were experiencing difficulty in getting up or down (from a sitting and standing position) and walking (horizontal areas and short stairways). Arthritic dogs having any other serious disease or complications (such as hepatic or renal disease) were not included in the study. The owner consent was obtained before initiation of any experiments. The protocol of the present investigation for using arthritic dogs and their treatment was in compliance with the Murray State University Guidelines. UC-II is a standardized, undenatured (native) type II collagen complex containing 10 mg undenatured type II collagen in capsule form for use as a dietary supplement and was provided by InterHealth Nutraceuticals Inc., Benicia, CA, USA. UC-II is manufactured in a GMP facility at a low temperature, which preserves its undenatured form and biological activity. Glucosamine HCI and chondroitin sulfate were also provided as capsules by InterHealth Nutraceuticals. Twenty arthritic dogs were randomly divided into four groups (n=5) and received daily treatment as follows: group I (placebo), group II (10 mg UC-II), group III (2,000 mg glucosamine HCI + 1,500 mg chondroitin sulfate), and group IV (10 mg UC-II * 2,000 mg glucosamine HCI + 1,500 mg chondroitin sulfate). The treatment was given daily for 120 days, followed by a 30-day withdrawal period. None of the dogs received any NSAIDs for 3 to 4 weeks before the study or during the study period. The dogs were evaluated for overall pain, pain upon limb manipulation, and exercise-associated lameness on a monthly basis for a period of 150 days. Overall pain was measured as a general gross observation, which included trouble in standing after sitting, or trouble in sitting after standing, vocalization, crying, etc. Results were graded on a scale of 0 to 10: 0, no pain; 5, moderate pain; and 10, severe and constant pain. Pain upon limb manipulation was evaluated by animals' vocalization or other observations of pain during the extension and flexion of all four limbs for few minutes. Results were graded on a scale of 0 to 4: 0, no pain; 1, mild; 2, moderate; 3, severe; and 4, severe and constant. Lameness was measured after physical exercise forgross observations, which included limping, holding limb up, rigidity of limbs, etc. Signs of pain and lameness were noted on a scale of 0 to 4: 0, no pain; 1, mild; 2, moderate; 3, severe; 4, severe and constant. Severity of pain during various activities, such as standing from sitting, sitting from standing, playrng, and vocalization, and during extension and flexion of limbs was the basis for gradation. Body weights and physical evaluation were determined on a monthly basis. Gross observations were evaluated and recorded monthly using a questionnaire regarding the overall activity and the improvement of the arthritic symptoms. Furthermore, overall performance of individual groups was assessed, which include running, participation in jogging activities, movement up and down stairs, comfort ability in moving from sitting to standing position(s), cheerful attitude toward playing and jumping, etc. Blood samples were collected by jugular venipuncture using 22-gauge needles and 12-ml syringes. Serum was separated in a marble-top tube (serum separating tubes without anticoagulant) and transferred into plastic snap-top tubes. Serum samples were frozen immediately and kept at -80oC until analyzed for blood urea nitrogen (BUN), creatinine, bilirubin, and alanine aminotransferase (ALT), using Beckman Coulter CXS-PRO Synchron Clinical System (Fullerton, CA). Bilirubin and ALT were used as markers of liver function and BUN and creatinine were used as markers of renal and heart function. The data of serum chemistry in Table 1 and of pain observation in Figures 1 to 3 are presented as mean + SEM. Statistical significance of differences was determined by analysis of variance (ANOVA) coupled with Tukey-Kramer test using the NCSS 2000 Statistical System for Windows. Differences with p < 0.05 were considered statistically significant. Data of pain evaluation in arthritic dogs receiving placebo and those receiving UC-II alone or in combination with glucosamine and chondroitin are shown in Figures 1 to 3. Dogs receiving placebo (group 1) exhibited no significant change in arthritic conditions at any time during the course of treatment. Dogs receiving UC-II (10 mg/day) alone (group II) showed significant reduction in overall pain within 30 days (33%) and pain upon limb manipulation and exercise-associated lameness after 60 days (66% and 44%, respectively) of treatment. Maximum reductions in the pain were noted after 120 days treatment (overall pain, 62%; pain upon limb manipulation, 91%; and exercise-associated lameness, 78%). Glucosamine plus chondroitin (group III) alleviated some pain but not significantly (p > 0.05). Group IV dogs receiving a combination of UC-II and glucosamine plus chondroitin showed marked reductions in overall pain (57%), pain upon limb manipulation (53%), and exercise-associated lameness (53%) after a daily treatment of 120 days. Following the withdrawal of supplements in either of the groups (group II to IV) for 30 days, all dogs experienced a relapse of overall pain, pain upon limb manipulation, and exercise-related lameness. In addition, UC-II-treated dogs were more playful, energetic, and less painful compared to other groups used in this study. None of the dogs receiving dietary supplements showed any signs of adverse effects. There were no significant changes in any markers of liver function (ALT and bilirubin) or renal or heart function (BUN and creatinine) during the course of this investigation. Body weight remained within the normal range throughout the course of this study. An increase in body weight was observed in the placebo group, demonstrating that activity level in that group was less than the other supplemented group. (b) whether these supplements are well tolerated by arthritic dogs, following a long term of their use. 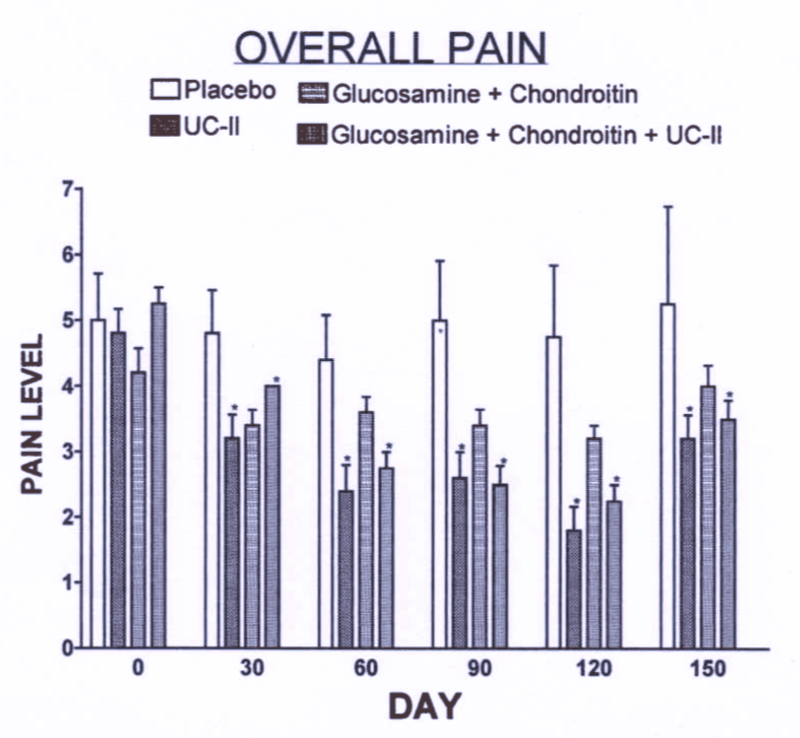 The present findings revealed that UC-II therapy (10 mg/day) alone or in combination with glucosamine plus chondroitin for 120 days provided significant improvement in the overall pain, pain upon limb manipulation, and pain after physical exertion. The greatest physical improvements were noted in UC II supplemented group after a treatment period of 120 days, suggesting that prolonged treatment with the supplement may lead to better therapeutic results. After a 30-day withdrawal period, all dogs who had received treatment suffered from a relapse of signs and symptoms associated with arthritic conditions, such as pain and lameness. All supplements were well tolerated and no adverse effects were observed. 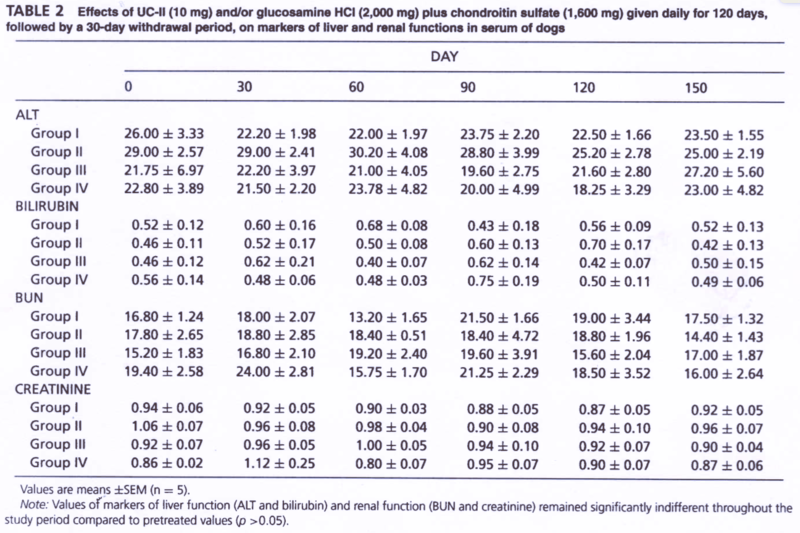 FIGURE 1 Effects of UC-II (10 mg) and/or glucosamine HCI (2,000 mg) plus chondroitin sulfate (1,600 mg) given daily for 120 days, followed by a 30-day withdrawal period, on overall pain in arthritic dogs. Overall pain was graded on a scale of Oto 10: 0, no pain; 5, moderate pain; and 10, severe and constant pain.• Indicates significant difference from pretreated values (p < 0.05). 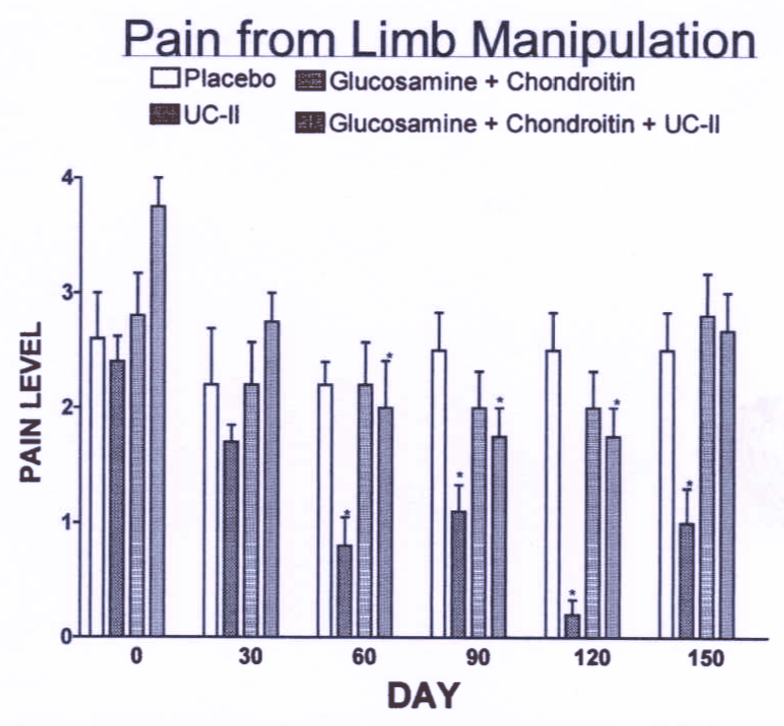 FIGURE 2 Effects of UC-II (10 mg) and/or glucosamine HCI (2,000 mg) plus chondroitln sulfate (1,600 mg) given dally for 120 days, followed by a 30-day withdrawal period, on pain upon limb manipulation In arthritic dogs. Pain upon limb manipulation was evaluated by animal's vocalization or other observations of pain during the extension and flexion of all four limbs for few min. Results were graded on a scale of 0 to 4: 0, no pain; 1, mild; 2, moderate; 3, severe; and 4, severe and constant. • Indicates significant difference from pretreated values (p < 0.05). In a recent double-blind pilot study, UC-II (1 mg or l0 mg/day, PO for 90 days) was found to be significantly effective in ameliorating arthritic pain in dogs (DeParle et al. 2005). A 10-mg dose of UC-II provided markedly greater effects in all parameters measured for the arthritic symptoms than 1 mg dose in improving the overall performance and well-being of the dog. 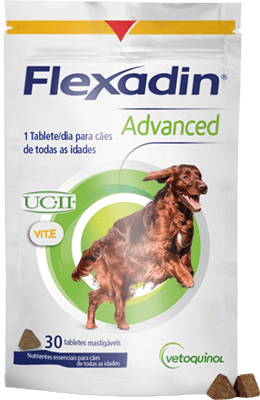 The findings of the present study revealed that the arthritic dogs receiving UC-II (10 mg/day) in combination with glucosamine and chondroitin (group IV) overall performed better than glucosamine (2,000 mg) plus chondroitin (1,600 mg) (group III). The most commonly used two nutraceuticals (glucosamine and chondroitin) provided some beneficial antiarthritic effects, but not significantly (p > 0.05), which suggested that the observed therapeutic effects were mainly due to the supplementation of UC-II. The findings also revealed that though the beneficial effects of UC-II were observed within 30 days, maximum effects were seen after 120 days. UC-II functions through a process called oral tolerization (i.e., this process takes place in the small intestine, where food is absorbed). Through a complex series of immunological events, patches of lymphoid tissue (Peyeis patches) surrounding the small intestine screen incoming compounds and serve as a "switch" to turn the body's immune response to foreign substances on or off, depending on what the substance is (Mowat 1987). 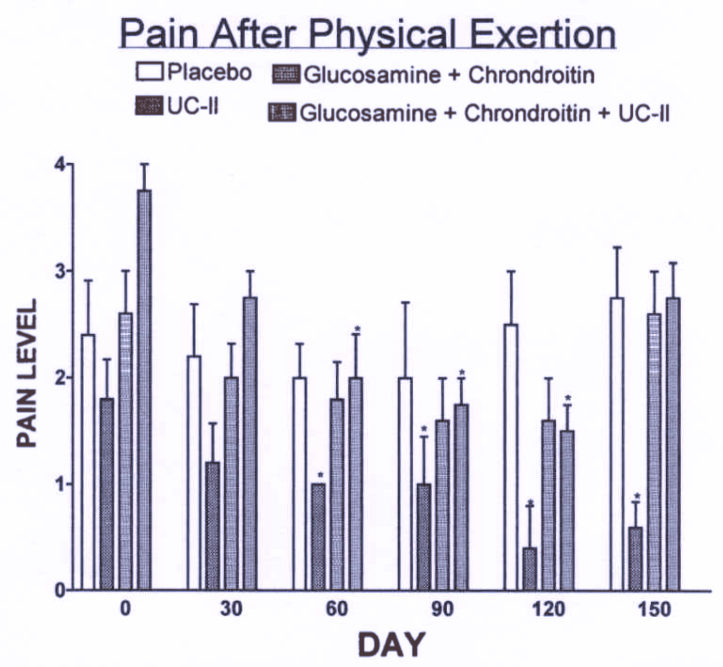 FIGURE 3 Effects of UC-II (10 mg) and/or glucosamine HCI (2,000 mg) plus chondroitin sulfate (1,600 mg) given daily for 120 days, followed by a 30-day withdrawal period, on pain after physical exercise in arthritic dogs. Lameness was measured after physical exercise for limping, holding limb up, rigidity of limbs, etc. Signs of pain and lameness were graded on the scale of O to 4: O, no pain; 1, mild; 2, moderate; 3, severe; and 4, severe and constant. • Indicates significant difference from pretreated values (p < 0.05). In the case of type II collagen, small amounts of UC-II (typically 10 mg or less/day, PO) have been shown to turn off the immune response targeted at type II collagen present in bone joint cartilage without any side effects (Weiner et al. 1994; Sieper et al. 1996; Gimsa et al. 1997). This process helps the body to differentiate between elements that are foreign invaders to the body and those that are nutrients (Weiner 1997; Trentham 1998). Previous studies have demonstrated that UC-II improves joint mobility and flexibility by the mechanism of preventing the immune system from attacking and damaging its own joint cartilage (Mowat 1987; Sieper et al. 1996; Gimsa et al. 1997; Trentham 1998; Trentham et al. 1993, 1994, 2001). Unlike UC-II, glucosamine and chondroitin are expected to cause decrease of pain sensation, pro­vide an improved resistance to additional joint tissue breakdown, and rejuvenate some joint tissues. Studies suggest that glucosarnine helps to relieve pain by enhancing proteoglycan synthesis, which is impaired in ostfoarthritic cartilage (Hougee et al. 2006). Chondroitin sulfate aids in keeping cartilage tissue from dehydrating and assists in cushioning impact stress and reduce joint pain. Earlier studies demonstrated that combining chondroitin sulfate with glucosamine may improve arthritic symptoms and may have some benefi­cial effects. However, these supplements are not known to reverse structural changes in a joint such as torn cartilage, calcium deposits, and advanced scar tissue. In spite of these beneficial effects of glucosarnine and chondroitin described elsewhere, in the present study we did not find significant antiarthritic effects in dogs using the above combination. A recent multicenter with 1,583 patients with symptomatic osteoarthritis in the knee received 1,500 mg of glucosamine and 1,200 mg of chondroitin sulfate daily. They reported that the combination or supplements alone did not reduce pain effectively in the overall treatment groups (Clegg et al. 2006). Another benefit of the present study resulted in healthy weight maintenance in supplemented groups, compared to control. Body weight was maintained in all supplemented groups, while there was an increase in body weight in the placebo group. This demonstrated that the dogs were more active and arthritic symptoms were remarkably reduced in the supplemented group. Weight control has been shown to indirectly influence the degenerative joint disease process by reducing the stress on the joint (Eaton 2004). A small amount of weight loss reduces the risk of developing arthritis in dogs and human. In conclusion, the present study suggests that daily treatment of arthritic dogs with UC-II alone or in combination with glucosamine plus chondroitin ameliorates signs and symptoms of arthritis significantly greater than glucosamine and chondroitin. The results of this study also demonstrate that the supplements are well tolerated. The relapse seen in dogs 30 days posttreatment showed that continuous treatment is required. Aceves-Avila, F.J., Medina, F., and Fraga, A. 2001. The antiquity of rheumatoid arthritis: a reappraisal. J. Rheumatol. 28:751 - 757. Bagchi. D., Misner, B., Bagchi, M ., Kothari, S.C., Downs, B.W., and Preuss, H.G. 2002. Effects of orally administered undena­ tured type II collagen against arthritic inflammatory diseases: a mechanistic exploration. Intl. J. Clin. Pharmacol Res. 22:101- 110. Bellamy, N., Carr, A., Dougados, M., Shea, B., and Wells, G. 2001 . Towards a definition of "differences" in osteoarthritis. J. Rheumatol. 28:427-430. Bongartz, T., Sutt on, A.J., Sweeting, M.J., Buchan, I., Matteson, E.L., and Monto ri, V. 2006. Anti-TNF antibody therapy in rheumatoid arthritis and the risk of serious infections and malignancies: systematic review and meta-analysis of rare harmful effects in randomized controlled trials. JAMA. 295:2275- 2285. Center for Disease Control and Preventi on. 1994. Prevalence of disability and associated with health conditions-United St ates, 1991-1992. MWRW 4341:737-259. Clegg, D.O., Reda, D.J., Harris, C.L., Klein, M .A., O'Dell, J., Hooper, M.M ., Bradley, J.D., Bingham, C.O. Ill., Weisman, M.H., Jackson, C.G., Lane, N.E., Cush, J.J., Moreland, L.W., Schumacher, H.R., Oddis, C.V., Wolfe, F., Molitor, J.A., Yocum, D.E., Schnitzer, T.J., Furst, D.E. , Sawitzke, A.D., Shi, H., Brandt, K.D., Moskowitz, R.W., and Williams, H.J. 2006. Glucosamine, chondroitin sulfate, and the two in combination for painful knee oste oarthritis . N. Engl. J. Med. 354:795- 808. DeParle, L.A., Gupta, R.C., Canerdy, T.D., Goad, J.T., D'Altilio, M., Bagchi, M., and Bagchi, D. 2005. Efficacy and safety of glycosylated undenatured type-II collagen (UC-11) in therapy of arthritic dogs. J. Vet. Pharmacol. Ther. 28:385-390. Eaton, C.B. 2004. Obesity as a risk factor for osteoarthritis : mechanical versus metabolic. Med. Health R I. 87:201- 204. Gimsa, U., Sieper, J., Braun, J., and Mitchison, N.A. 1997. Type II collagen serology: a guide to clinical responsiveness to oral tolerance?. Rheumato.l Int. 16:237- 240. Goldring , M.B. 2000. Osteoarthritis and cartila ge: the role of cytokines. Curr. Rheumato.l Rep. 2:459-4 65. Helmick, C.G., Lawrence, R.C., Pollard, R.A., Lloyed, E., and Hayes, S.P. 1995. Arthritis and other rheumatoid conditions: who is affected now, will be affected later? National Arthritic Data Workgroup. Arthritic Care Res. 8:203-211. Hielm-Bjorkman, A.K., Kuusela, E., and Liman, A. et al. 2003. Evaluation of methods for assessment of pain associated with osteoarthritis in dogs. J. Am. Vet. Med. Assoc. 222 :1552-1558. Hougee, 5., Hartog, A., Sanders, A., Graus, Y.M., Hoijer, M.A., Garssen, J., Van Den Berg, W., van Beuningen, H.M., and Smit, H.F. 2006. Oral administration of the NADPH-oxidase inhibitor apocynin partially restores diminished cartilage proteoglycan synthesis and reduces inflammation in mice. Eur. J. Pharmacol. 531:264-269. Matteson , E.L. 2000. Historical perspective on the classification of vasculitis. Arthritis Care Res. 13:122-127. Mowat, A.M. 1987. The regulation of immune responses to dietary protein antigens. Immunol. Today. 8:93-98. Muhlfeld, A., and Floege, J. 2005. COX-2 inhibitor induced anuric renal failure in a previously healthy young woman. Clin. Nephrol. 63:221-224. Okada, Y. 2000. Pathoetiology of chronic rheumatoid arthritis-from inflammation to bone destruction. From viewpoint of pathology. Nppon Naika Gakkai Zassi. 89:2072-2080. Paroli, E., Antonilli, L., and Biffoni, M. 1991. A pharmacological approach to glycosaminoglycans. Drugs Exptl. Clin. 18:335-343. Peat, G., McCamey, R., and Croft, P. 2001. Knee pain and osteoarthritis in older adults : a review of community burden and current use of primary health care. Ann. Rheum. Dis. 60:91- 97. Physicians Desk Reference. 1998 . 52 nd ed. Medical Economics Company Inc., Montvale, NJ, USA. Richardson, D.C., Schoenherr, W.D., and Zicker, S.C. 1997. Nutritional management of osteoarthritis . Vet. Clin. North Am. Small Anim. Pract. 27:883- 911. Sieper, J., Kary, 5., Sorensen, H., Alten, R., Eggens, U., Huge, W., Hiepe, F., Kuhne, A., Listing, J., Ulbrich, N., Braun, J., Zink, A., and Mitchison, N. 1996. Oral type II collagen treatment in early rheumatoid arthritis . A double-blind, placebo-controlled, randomized trial. Arthritis Rheumatol 39:41- 51. Trentham, D.E. 1998. Oral tolerization as a treatment of rheumatoid arthriti s. Rheum. Dis. Clin. North Am. 24:525-536. Trentham, D.E., Dynesius-Trentham, R.A., and Orav, E.J. et al. 1993 . Effects of oral administration of type-II collagen on rheumatoid arthritis. Science 261:1727-1730. Trentham, D.E., Halpner, A.D., and Trentham, R.A. et al. 2001. Use of undenatured type-II collagen in the treatment of rheumatoid arthritis. Clin. Pract. Alter. Med. 2:254- 259. Weiner, H.L. 1997. Oral tolerance: immune mechanisms and treatment of autoimmune diseases. Immunol. Today. 18:335- 343. Weiner, H.L., Friedman, A., Miller, A., Khoury, S.J., Al-Sabbagh, A., Santosh, L., Sayegh, M ., Nussenblatt, R.B., Trentham, D.E., and Hafler, D.A. 1994. Oral tolerance: immunological mechanisms and treatment of animal and human organ-specific autoimmune diseases by oral administration of autoantigens. Ann. Rev. Immunol 12:809- 837.